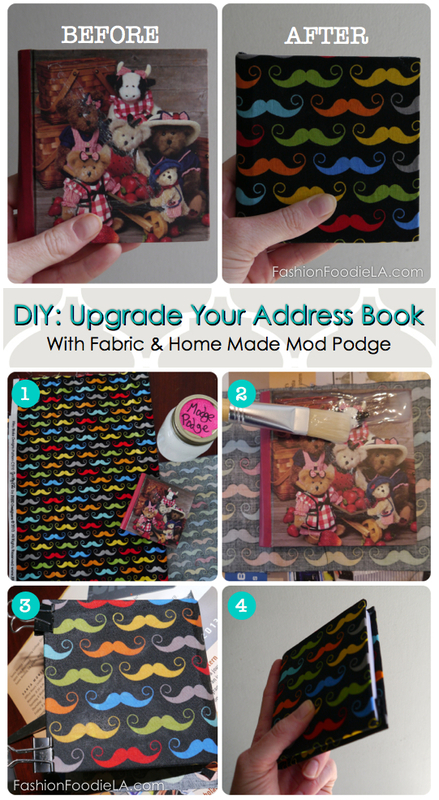 DIY: Upgrade Your Address Book with fabric and homemade mod podge! Recovering your old address book is so much easier than re-writing them into a new address book. As you know from the stool I revamped, I really like this rainbow mustache fabric from Riley Blake. The first thing you need for this project is Mod Podge. You can find out how to make it here, or you can grab some from the craft store, but I warn you it can be expensive. Only do one side at a time, but mod podging the binding of the address book with each side, so that it has been glued twice. The binding will have the most movement, so do not soak it, but just paste it down. Using the plastic card, push the extra mod podge off. Start at the binding and move toward the edge. Take the clips off the edges when it is about 3/4 of the way dry. Bling at a Baby Shower!